Locate the problem, before you dig! Aqua-Blast can locate the problem with CCTV to the exact spot! Before your plumber starts digging random holes trying to find the problem, call Aqua-Blast! 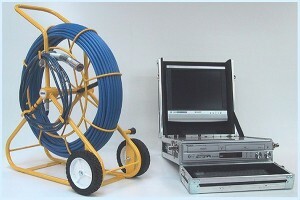 We provide you or your plumber with a DVD of the problem and the exact place and depth by using the navitrack locator. This tells you whether you need a shovel or an excavator! Don’t wait for the next downpour to discover the problems with drains or pipe work, let AquaBlast identify any potential faults before they become a problem. Using CCTV camera inspection technology we can provide accurate diagnosis of both blockages and potential problems. Over time drains and sewer pipes may deteriorate due to reasons such as ground movement, poor construction, tree root infiltration and household waste build up. Aqua-blast use quality Ratech push rod cameras to provide video CCTV surveys and recordings of drains, pipes, and sewers at highly competitive rates providing an accurate and economic means to detect problems at the source. Depending on pipe condition and layout our cameras are able to survey up to 60 meters in pipes ranging between 2 to 10 inch’s in diameter. Pipe Inspection is also recommended before purchasing property, rectifying structural defective and poor workmanship in both old and new pipes can be costly consider the piece of mind that pipe surveying can bring before your next purchase.